The flooding and the trail of destruction left behind by Hurricane Sandy on the East Coast of the United States put a renewed focus on the economic damages caused by natural disasters. With President Obama about to sign a $51 billion aid package for Sandy victims, we wonder: What year has brought the highest economic toll so far? The economic costs caused by natural disasters that struck the world in 1995 set a new record at the time. The most expensive disaster that year was the January 17 Kobe earthquake, whose epicenter lay just 15 miles outside Japan’s fifth-largest city and fourth-largest port. Munich Re, the German reinsurance company, estimates the economic damage from the Kobe earthquake — including property damage and lost economic activity — at $148 billion (in 2011 dollars), or about 60% of the $250 billion total in damages that year. 2005 began ominously, with clean up and rescue getting underway in the regions of the Indian Ocean devastated by the tsunami that had struck on December 26, 2004. The final tally of the disasters that struck in 2005 was $262 billion. Most of those damages were the result of Hurricane Katrina, which swept through the Caribbean and struck the Gulf Coast of the United States on August 29. Munich Re estimated Katrina’s economic costs at $144 billion — or 55% of that year’s total. At the same time as Katrina, heavy floods wreaked havoc in parts of Germany, Austria, Switzerland and Romania. In June, monsoon-related flooding caused devastation in the Indian state of Gujarat, and a month later, flooding hit the state of Maharashtra and brought the city of Mumbai to a standstill. In October, a 7.6-magnitude earthquake struck Kashmir, killing 79,000 people. According to estimates compiled by Munich Re, the economic damages caused by natural disasters last year was $387 billion. That figure exceeded the previous high of $262 billion, in 2005, by nearly 50%. Economic damages in 2011 were dominated by a single disaster — the devastating earthquake and tsunami that struck the East coast of Japan on March 11 and the subsequent meltdown at the Fukushima nuclear power plant. 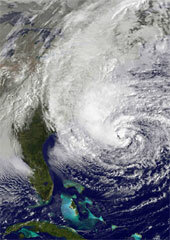 The disaster caused an estimated 15,870 deaths and caused $210 billion in damages. While this accounted for more than half of the total damages in 2011, that year also brought massive floods in Thailand, China and Australia, a major earthquake in New Zealand and a variety of tornados, floods and wildfires in the United States. Some experts have suggested that the economic damages from Hurricane Sandy in the United States alone (that is, not counting damages that occurred in the Caribbean) could reach as high as $55 billion. If that turns out to be correct, it would rank as the fourth-most expensive natural disaster in history. Four of the five costliest years in terms of damages caused by natural disasters have occurred since 2004. Between 2001 and 2011, the world experienced an average of 385 natural disasters a year that resulted in loss of live, property damage, as well as impairing economic activity. In fact, the 3,852 disasters that occurred during this ten-year period killed more than 780,000 people and affected over two billion more, according to the Center for Research on the Epidemiology of Disasters. Cumulatively, they caused at least $960 billion in economic damage. Editor’s note: To listen to The Globalist’s Stephan Richter discuss this quiz with Marketplace Morning Report host Jeremey Hobson, click here to open a pop-up media player.